Springvale is a suburb in Melbourne, Victoria, Australia, 23 km south-east of Melbourne's central business district. Its local government area is the City of Greater Dandenong. At the 2016 census, Springvale had a population of 21,714. Springvale is a large suburb occupying 11.2 km², bounded by Westall Road to the west, Princes Highway and Police Road to the north, the Springvale Crematorium and Corrigan Road to the northeast, Heatherton Road to the south and Lawn Road to the southeast. 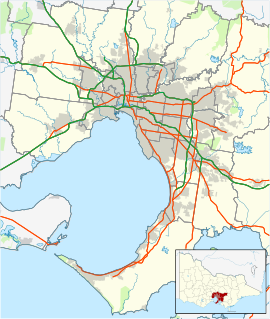 Springvale is linked to Melbourne's CBD by Monash Freeway via the Ferntree Gully Road exit to the suburb's northwest. The municipal area of Springvale was originally part of the Dandenong shire and is at the doorstep of the Dandenong Ranges National Park. The area contained natural springs which were a permanent water source for stock and travellers moving between Melbourne and Dandenong, giving rise to the suburb's name. In the 1850s, a Spring Vale Hotel was built near a newly surveyed route between Oakleigh and Dandenong at what is now the intersection of Princes Highway and Springvale Road. However, it did not develop into a settlement. The first Springvale Post Office opened on 12 September 1864 and closed in 1892. This office had been superseded by Springvale Railway Station office (opened 1887) which was renamed Springvale in 1902. A Springvale North Post Office was also open between 1946 and 1978. In 1886, land was subdivided near the railway station and the area began to grow. By the 1920s the Spring Vale community had a lodge, brass band, a recreation reserve, a mechanics' institute, a few shops and some houses in the township. A picture theatre opened in 1924. At the outbreak of the second world war Springvale was a pastoral, residential and industrial township with market gardens in the surrounding areas. Sand extraction industries were active, lasting until the 1990s. The clearest indication of postwar residential growth occurred in the early 1960s when Rockman's Shopwell department store was built, and later when shops on the east side of Springvale Road were removed for road widening. Housing growth was rapid and estates with made roads and services replaced unserviced subdivisions. The new Sandown racecourse site was opened in 1961 for both horse and motor-car racing. On the north of the Princes Highway is the Springvale Crematorium and Necropolis. Next to the Crematorium is an area of housing and the original Springvale primary school near where Centre and Springvale Roads cross Princes Highway. The suburb is mostly residential, although some small industrial areas are scattered through the suburb's northwest and northeast. Eastern Springvale contains Springvale Crematorium and Necropolis, one of Melbourne's three main cemeteries, and the Sandown motor raceway. Springvale was once a city in its own right, but a local government boundary reshuffle in December 1994, saw part of the municipality amalgamated into the City of Greater Dandenong and the rest merged into the new City of Kingston. Springvale remains home to the Sandown Racecourse, and is also known throughout Australian revhead circles as the home of the Sandown International Motor Raceway which hosts a number of major car races every year including the Sandown 500, a key event in the V8 Supercar series, and formerly the Sandown Challenge. In 2014, Springvale had an estimated population of approximately 20,200. The residents of this suburb have higher levels of migrant settlement, cultural diversity and limited English proficiency than Greater Dandenong, lower median incomes and lower rates of early school leaving. The 2011 Census found that 69% of Springvale residents were born overseas, higher than for Greater Dandenong and more than double the corresponding metropolitan proportion (33%). Among the 99 birthplaces of its residents were Vietnam (21%), India (11%), Cambodia (5%) and China (5%). Rates of migrant settlement are relatively high, with 8% of residents having arrived in Australia within the previous 2.5 years – similar to the figure for Greater Dandenong, of 7%. Languages other than English are spoken by 79% of Springvale residents – compared with 64% for Greater Dandenong. Twenty-two per cent have limited fluency in the use of spoken English, higher than the municipal level of 14% and over five times the metropolitan level of 4%. Among the major religious faiths are Buddhism, adhered to by 27.3% of residents, and Catholicism (21%). Nine per cent of young adults (20–24 years) had left school before completing year 11 – lower than both the municipal average of 13% and the metropolitan level, of 10%. Median individual gross incomes of $352 p.w., recorded in the Census, are the lowest in Greater Dandenong and equivalent to 55% of metropolitan levels. Of the 6,489 homes in Springvale, 16% are flats, less than the proportion across Greater Dandenong of 21%, though more than the metropolitan level of 11%. Sixty-one per cent of homes are owned or being purchased by their occupants – less than the metropolitan level of 71%. The suburb has an Australian Rules football team, Springvale District Football Club, competing in the Southern Football League. Sandown International Motor Raceway incorporates a motor racing track with permanent pit and grandstand facilities. It is accessible from the Princes Highway and via Sandown Park railway station. The Sandown Racecourse is co-located with the motor raceway, and is one of the four horse racing venues in Melbourne. On the other (southwestern) side of the railway is Sandown Park Greyhound Racing Track. Springvale Neighbourhood House was established in 1983 with the aim of providing a resource centre for self-help, social, cultural and action groups. Over 40 self-help groups meet at the house, including ESL, Computer and Horticulture classes and celebrations such as Refugee Week, Sumnation and Adult Learners Week. Springvale is very safe for the Australian Labor Party at both federal and state elections. At federal level the suburb is divided between the federal divisions of Hotham, currently held by Clare O'Neil, and Bruce, held by Alan Griffin. Springvale is split between the electorates of Clarinda, Keysborough and Mulgrave. Springvale was divided between the Springvale Central and Springvale North wards of the City of Greater Dandenong, represented respectively by Youhorn Chea (a councillor since 1997) and Alan Gordon. Springvale and Springvale South now form most of the Lightwood Ward of the City of Greater Dandenong. Springvale has two railway stations: Springvale and Sandown Park. Both are located on the Pakenham and Cranbourne railway lines. Several bus routes also run through the suburb including Smart Bus Route 902 to Airport West Shopping Centre and Chelsea Railway Station. Springvale Botanical Cemetery is the largest facility of its kind in Victoria. Van Tuong Nguyen - Convicted heroin smuggler, executed in Singapore on 2 December 2005. Members of the Australian alternative band TISM originated from the suburb. ^ a b c d e f g Australian Bureau of Statistics (27 June 2017). "Springvale (State Suburb)". 2016 Census QuickStats. Retrieved 3 December 2017. ^ Map 79, Melway (33rd edition, 2006), ISSN 0311-3957. This page was last edited on 22 July 2018, at 11:03 (UTC).